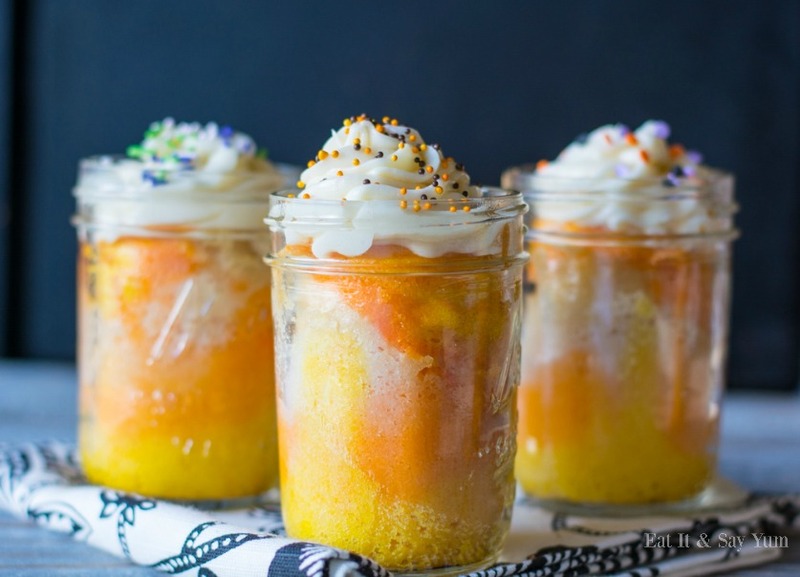 With Halloween just a couple weeks away, now is the perfect time to make up some of these Tie-Dye Candy Corn Cakes in a Jar! These individual serving sized cakes are so fun to make and eat! And I love how the colors swirl together, just like a tie-dyed shirt. My kiddos loved making these because anything you add food coloring to is ‘awesome’ in a kids mind. And let’s not forget the sprinkles!! 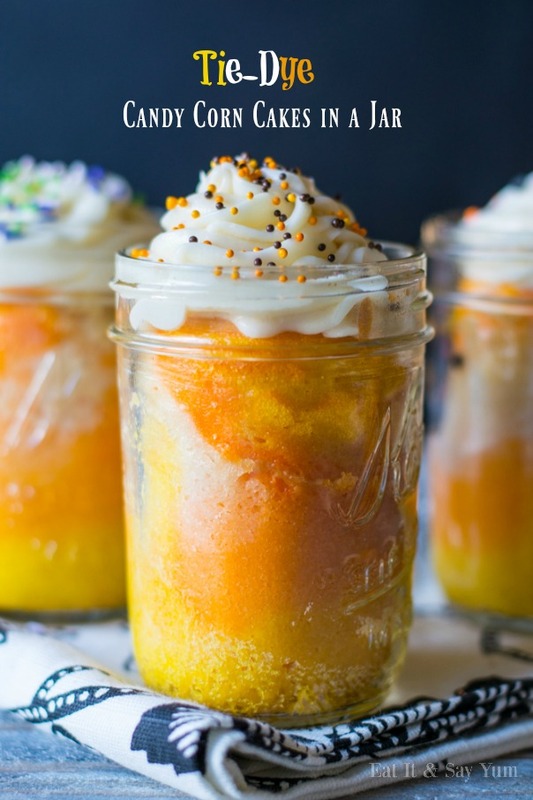 Time to break out your favorite Halloween sprinkles and go to town on these fun cakes in a jar. You can decorate each cake differently! Kids love that. Quick tip: hold your cakes over the sink, or place them on a wire cooling rack over the sink when adding the sprinkles. This way any spilled sprinkles will just fall into the sink, and not all over your counters! I think this dessert would be great for Halloween parties. It’s portable, and you don’t have to serve it! Just grab a spoon and start eating. This recipe makes 10-12 servings. Prepare the cake batter according to the directions on the package. Preheat oven to 350 degrees. 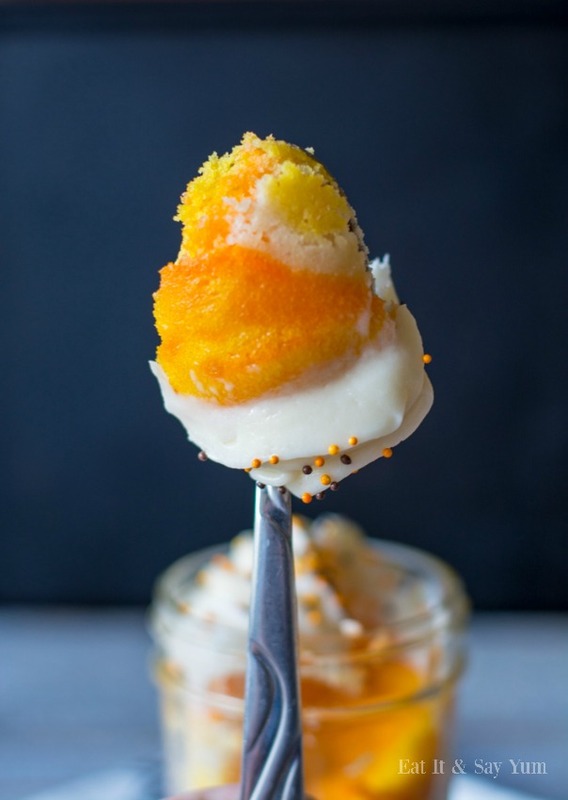 Divide the batter among 3 bowls and add yellow food coloring to one bowl, and orange coloring to another bowl. Stir the batters until you have a bowl of yellow, a bowl of orange, and a bowl of white batter. Grease 10-12, half-pint, glass canning jars. Divide the yellow batter among all the jars. Divide the orange batter among all the jars, on top of the yellow batter. Divide the white batter among all the jars, on top of the orange batter. 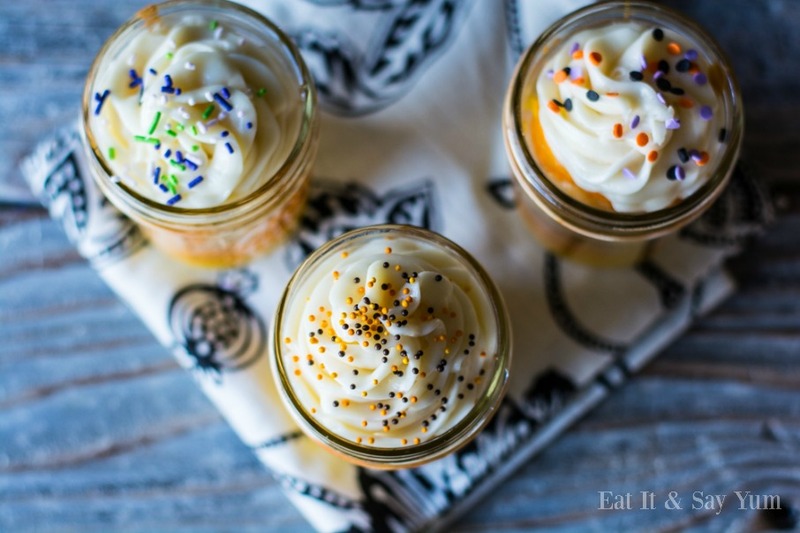 Place the jars on a cookie sheet, and bake in the oven for 20-25 minutes, or until the tops spring back when lightly touched- and/or a toothpick comes out clean when inserted into the cakes. Let the cakes cool, and make the frosting. In a large mixing bowl, beat the cream cheese until it is smooth. Add in the butter and shortening and beat again until smooth. Add the vanilla, and 1 cup of powdered sugar at a time. Beating between each addition. Now add the milk, 1-2 tsp at a time, beating after each addition. Add milk until you reach your desired consistency for the frosting. You don’t want it too thin or it won’t hold it’s shape when you pipe it on the cakes. Using a star tip and a piping bag, pipe the frosting onto the cooled cakes. Add your favorite sprinkles on top. Cakes are best if served the same day. For more delicious recipes, visit Eat It & Say Yum.